It all works so well on paper: Michael Grandage and Christopher Oram as director and set designer; John Logan behind the script; Ben Wishaw and Dame Judi Dench heading the cast. If any more of a hook was needed to guarantee an audience, the plot concerns Peter Pan and Alice in Wonderland (or at least their real-life inspirations). In some ways very little. The major problem is that very little goes right. For the audience, Peter and Alice is an almost pitch-perfect study in the average, the mediocre, the reassuringly dull. No doubt the brigades that travel on mass from the Home Counties, that can afford to sit in the stalls, that buy a programme, a drink and an ice-cream, that keep the West End at near maximum-capacity and that are, without doubt, vital to the on-going vitality of the London theatre scene, are going to be satisfied. However Charles Dodson and J.M Barrie would be appalled. Not necessarily by the character assassinations perpetrated on them by Logan, in scenes that often have a loose connection to reality, but certainly by the sheer lack of imagination displayed by everyone involved in the production. Peter Pan and Alice in Wonderland are two of the finest examples of the flexibility of the adult mind; the sheer imaginative range of Carroll’s wordplay and of Barrie’s adventuring is a joy that has not receded in over one hundred years. Peter and Alice fails to capture one tenth of this joy, this anarchic free-spiritedness, in one hundred minutes. Reading the description of Barrie’s original production of Peter and Wendy one learns that Tinkerbell was created by the expedient use of a mirror to reflect a light onto the stage so that it would seem to dart and fly. This illusion, using the simplest mechanism imaginable, holds more wonder than the entire po-faced philosophising of Logan’s script. To begin on the positives; Christopher Oram’s set is a delight. Opening on a musty office, it unfolds to a reveal the reassuringly sight of a chequer-board set and instantly recognisable Tenniel-inspired drawings of familiar characters. Given Peter Pan’s origins on stage it was a nice touch to reflect this in the use of classic flats that drop from the sky and retain a resolute two-dimensionality that highlights the artifice that lies behind theatre, and that means it will only ever be a simulacrum of reality. 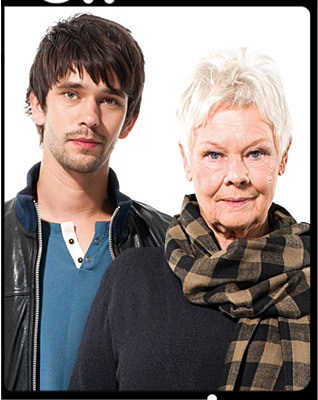 Ben Wishaw and Judi Dench are perfectly adequate, and one hopes that, given this was a preview, there is a certain vitality that is still to come as they feel their way into the roles. Dench has a commanding presence that cannot help but be transferred to her characters – it is hard to imagine her playing a particularly vulnerable part. Her Liddell has developed a cast-iron exterior to the pressures of the world, and this contrasts well with Wishaw’s more vulnerable Peter Davies, a man who has not come to terms with the world as it is and the man who he will always be. In casting terms one would imagine Wishaw to be perfectly cast as the emotionally fragile Peter Davies. He is an adult haunted by his childhood. A man out of step with the world around him. Wishaw has a trademark vulnerability that is complemented by his striking features – a physique that seems permanently set to break and a face that never seems to express less than the weight of mankind. Wishaw has pulled off much more difficult parts that capture, to varying degrees, adults caught in a state of adolescence. His Rupert-Goold directed Richard II for the BBC earlier this summer, and the acclaimed Hamlet that propelled him to national attention, demonstrates that he has the range. However in Peter and Alice his character never comes to life. Much of it is stultifyingly one-note; there is little range, not much in the way of a narrative arc and nothing of a much-needed sparkiness in his on-stage dynamic with Dench or the rest of the cast. However blaming the actors for lacking range seems unfair when the script never comes to life. The characters, and in particular the support from Dodson and Barrie, are terribly underwritten. They never seem more than caricatures – not necessarily a problem if Logan’s aim is to echo their books – but they are played as if fully three-dimensional, and as such neither come alive nor seem pantomime. The shadow-characters of Peter Pan and Alice in Wonderland are necessary devices but suffer from being incredibly irritating, either in performance or in the script. The issue of biographical accuracy is also a troubling one. It feels that J.M Barrie is captured relatively fairly – it details a relationship that was built by inveigling himself into the Davies household, a possible unrequited love, never acted upon, for Michael and an inevitable tragic passive-aggressive denouement when encroaching adulthood breaks the shackles of the children’s devotion to Barrie. One of the finest moments of the play concerns Barrie’s relationship with Michael, and Michael’s own final act. For a short while it points to what a play this could have been. Dodson gets a far rougher ride. Without going so far as to say that he did physically act inappropriately with Liddell, Logan creates a scene that certainly hints at the possibility and that suggests a definite emotional inappropriateness. The evidence for this scene occurring in real life is doubtful at best and seems to rest on the reason for Dodson’s sudden break with the Liddell family. There are other suggested reasons for this break, including the suggestion of a possible relationship between Dodson and Liddell’s governance. Clearly it is within the remit of the playwright to speculate where the evidence doesn’t exist, and Dodson has been an easy target for some time but one cannot help but wonder how much of this play is written entirely through the eyes of the 21st century. On the day that I went to see Peter and Alice, the artist Graham Ovenden, acclaimed as one of the greatest living painters of children, was arrested over sexual allegations. In recent weeks we have seen revelations emerge around Chetham’s School of Music. It is entirely necessary and appropriate to fully investigate all the accusations but it cannot be denied that it also shines an uncomfortable light on the relationship between artist and muse. This particular dynamic is one that perhaps people have always preferred to turn a blind eye to but in the environment of suspicion and re-investigation that was prompted and necessitated by the Saville revelations, one may fairly question, in an artistic sense, how it is even possible to begin understanding the motivations of Dodson in the Victorian-era; a time when even Conan-Doyle was entranced by the idea of fairies at the bottom of the garden? The greatest shame of this production is that it contains the nuggets of very interesting questions. Logan is clearly fascinated by the idea of interrogating the extent to which Alice and Peter have been shaped by their alter-egos. The idea of where their life begins and fiction ends has endless possibilities. 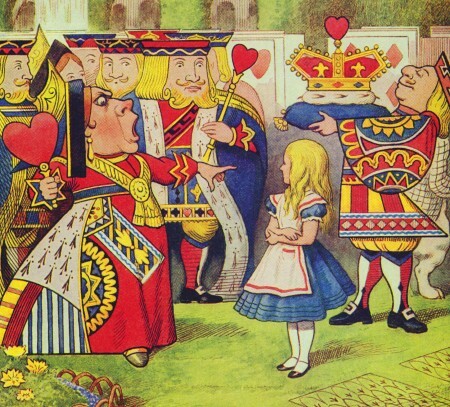 Right at the end of the play, Alice describes living in her library where she can return to Wonderland. All of a sudden it unlocks the question at the heart of the play: is it better to be Alice in Wonderland or the boy who never grew up? The tragic end of Peter Davies suggests the former, Alice always found a way to return but Peter can never quite face the ultimate truth; that children, once grown, can never return to Neverland. Peter will always be the boy who never grew up and the adult who did. The subject matter, the cast and the reputations may make this a hit but in another 100 years people will still be telling children about Captain Hook and the Mad Hatter’s Tea Party. It is less likely that they will be going to watch a revival of Peter and Alice. My daughters are named Alice and Wendy for reasons which may be obvious to you. I believe adults can return to Neverland with the right amount of destressing, whimsy and travel. I hope this comes to the US so I can sneak a peek too. Well I always hope that when I don’t like something there will be people out there who do enjoy it. Given your love of both books, I can only provide a further a note of caution – my biggest dissapointment with the whole production was down to the fact that it didn’t even contain an iota of the magic that J.M Barrie or Lewis Carroll contained in just one of their fingernails. By all accounts the acting has improved significantly and if you don’t know much about the backstory then it might prove to be of interest. However, sadly, I cannot honestly recommend it.